Meet Richard, a flight instructor from the United States. “Scientology is a map,” says Richard. Meet Rita, a vegan chef from the United States. “Scientology helps me with my job,” says Rita. Meet Marialaura, a fashion designer from Venezuela. “To me, Scientology is a very big window to understand everything,” says Marialaura. Meet Eric, a computer programmer from the United States. “What Scientology means to me is knowledge,” says Eric. Meet Romel, a crewing officer from the Philippines. “Scientology helps me a lot,” says Romel. Meet Gil, a general contractor from the United States. “I know who I am. I know what my goals are, I know where I’m going,” says Gil. Meet Paola, a business owner from Mexico. “Scientology has helped me to observe situations, make decisions and take action,” says Paola. Meet Michael, an electrical performance engineer from the United States. “To be honest, our marriage had some dark times,” says Michael. Meet Nick, a chartered management accountant from England. “There is a whole stack of exams I had to get through and I was really struggling in the early part of my career,” says Nick. Meet Ellen, a business administrator from Canada. “Before Scientology I was so introverted,” says Ellen. Meet Kieron, a precision sales engineer from Ireland. “I love being a Scientologist,” says Kieron. Meet Taylor, an artist from the United States. “Scientology definitely makes my life so much easier,” says Taylor. Who are Scientologists? Meet Niels, a farmer from Denmark. “The biggest thing I have achieved with Scientology is that I know I am a spiritual being,” says Niels. Meet Laurie, a science fiction writer from the United States. “Scientology gives me answers and the future is mine,” says Laurie. Meet Kun-Chen, a business executive from Taiwan. “To me, Scientology represents the various aspects of life,” says Kun-Chen. Meet Steve, a cartoonist from the United States. “With the various tools that I got through studying Scientology, I can do what I love doing,” says Steve. Meet Maria, an information technology salesperson from Canada. “Scientology has helped me keep a very harmonious marriage,” says Maria. Meet Brandon, a web design company owner from England. “My entire business is based on Scientology,” says Brandon. Meet Casey, a painter from Australia. “Before Scientology I was doing a lot of wrong things and hurtful things,” says Casey. Meet Karen, an office administrator from the United States. “I’ve traveled a bumpy road,” says Karen. Meet Alessio, a gardener from Italy. “Before I was withdrawn, I was even afraid of people…,” says Alessio. Meet Craig, a general dentist from the United States. “Scientology, to me personally, means freedom,” says Craig. Meet Jonathan, an electrician from the United States. “I always knew I could do anything,” says Jonathan. Meet Masao, a tea business owner from Japan. “By studying Scientology, I became able to see the existence of people—good people, bad people, they have specific characteristics,” says Masao. 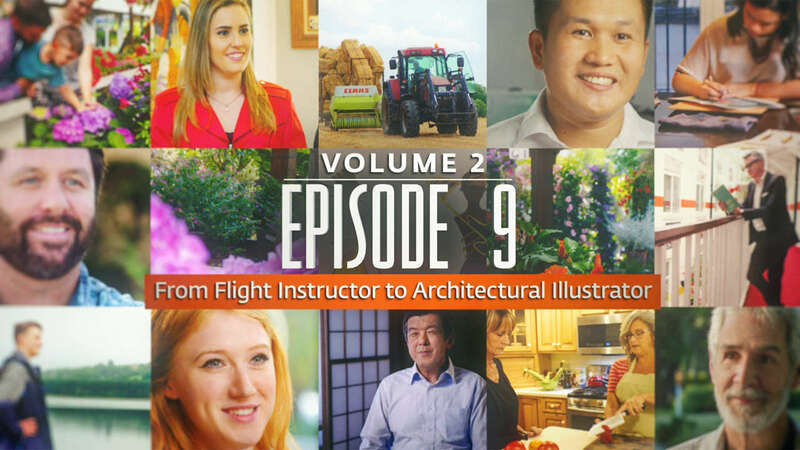 Meet Ian, an architectural illustrator from the United States. “Scientology has really helped me to focus, to be efficient with my work,” says Ian.